Here’s my regular post of ten year old photos… quite a few this month, and mostly transport-related. 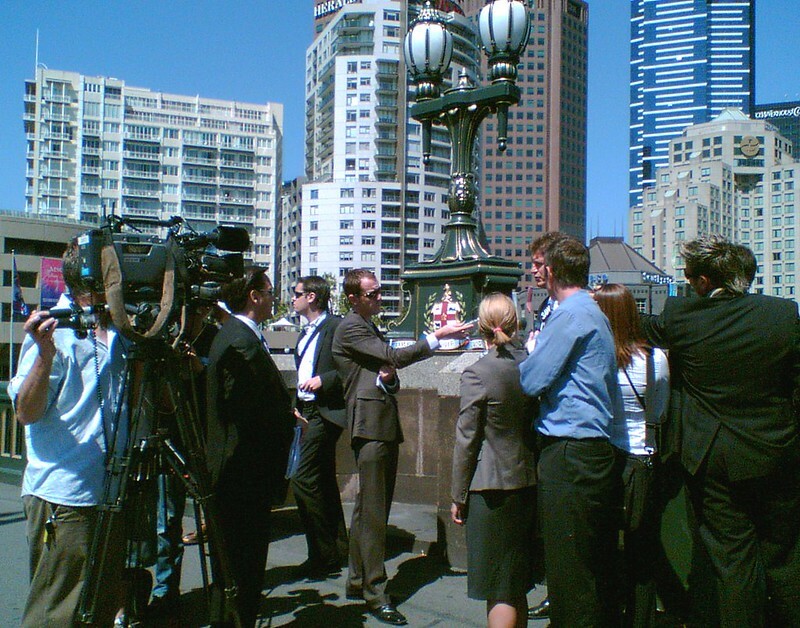 This is then-Opposition Leader, later Premier Ted Baillieu being interviewed by the media about widespread train disruptions at the time, caused by the Siemens train brakes problem reaching crisis point. I recall Age reporter Steve Moynihan (seen here facing away from Baillieu, but no doubt listening in) saying his mum was rapt he’d got several front page stories out of it. Large numbers of Siemens trains had been taken out of service, and this combined with strong patronage growth at the time meant many of the remaining trains on the network were at crush load during peak hours. This was the scene at Glenhuntly one Monday morning. Following the November 2006 election, the government had postponed the usual January fare rise until March, and in line with their election pledge (which was bipartisan), removed zone 3 as well (or to be precise, merged it with zone 2). At this time, V/Line fares also dropped by 20%, alongside better timetables as the Regional Fast Rail project was completed. 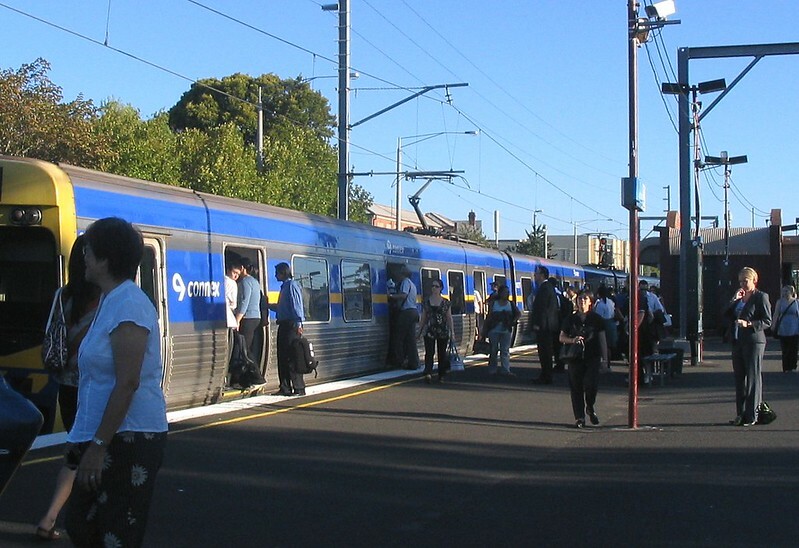 Cheaper fares and more trains resulted in V/Line patronage growth in the years following this. Not all Siemens train were out of service. 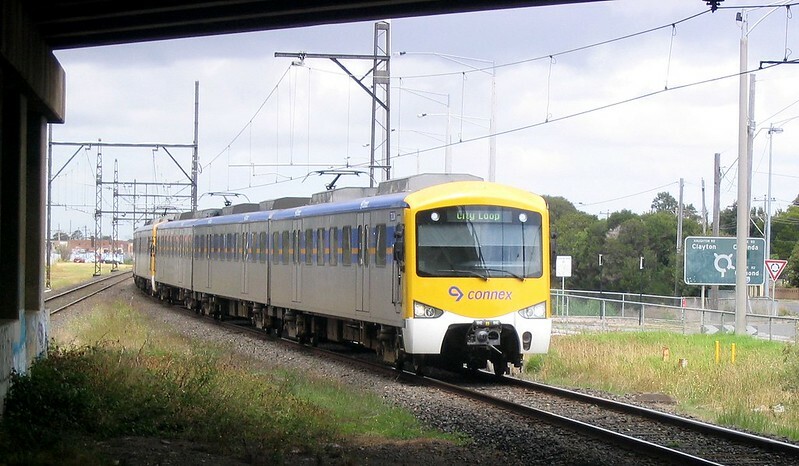 Here one in the Connex livery approaches Huntingdale station. 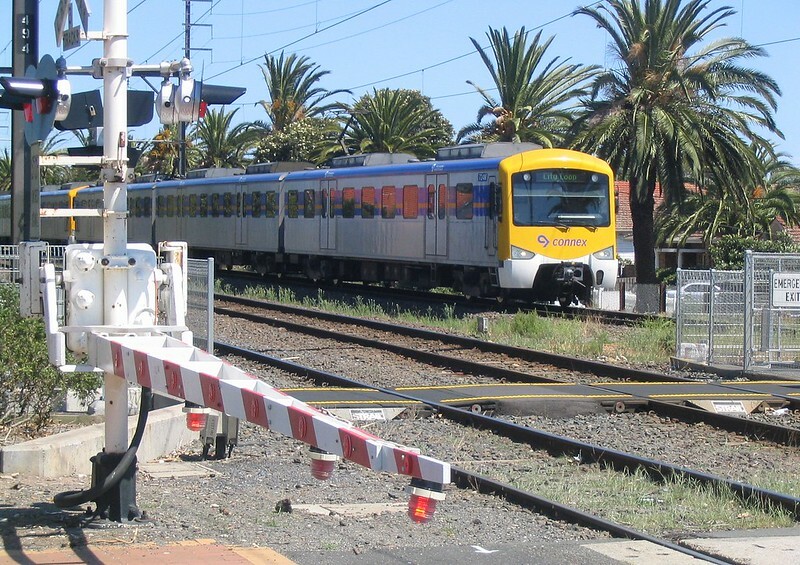 …and this one approaches the boom gates at Bentleigh station. This area all changed in 2016 with the level crossing removal. 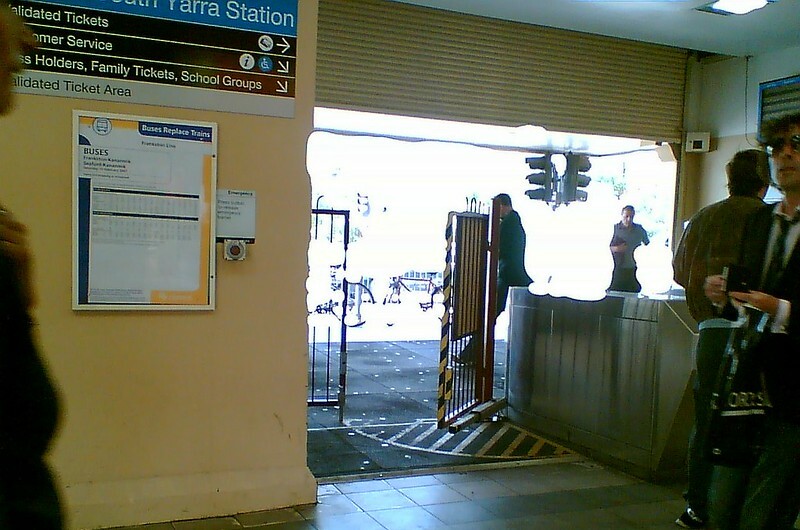 South Yarra station. What is the point of having fare gates if they always leave them unstaffed and open? 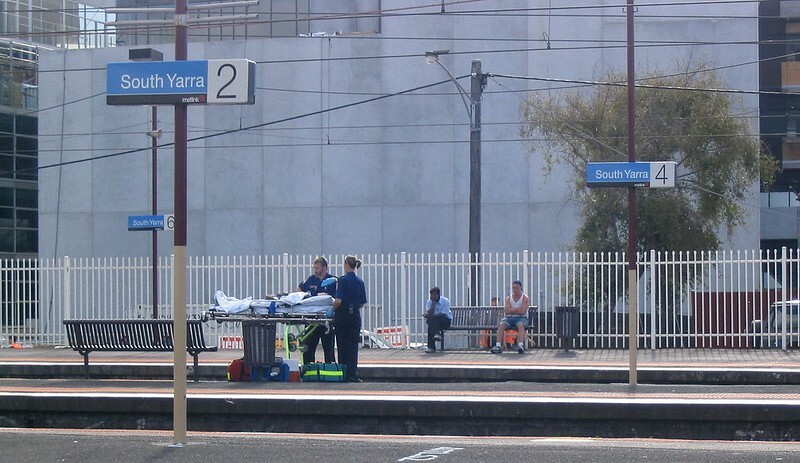 Paramedics wait on the station at South Yarra. Note the open space next to the station – another skyscraper has since filled this space. 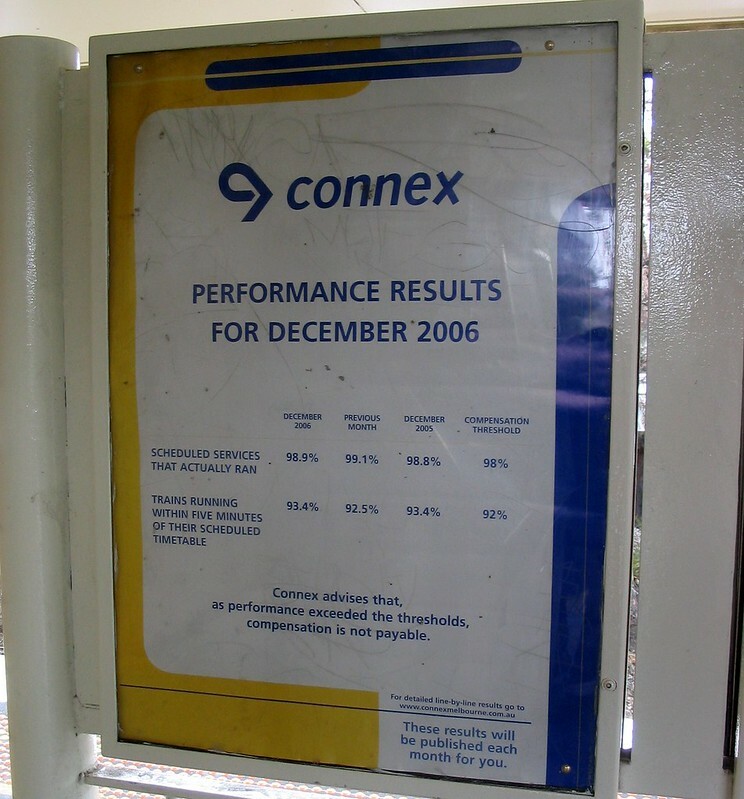 Connex met their December target. I don’t think they were so lucky in January and February. 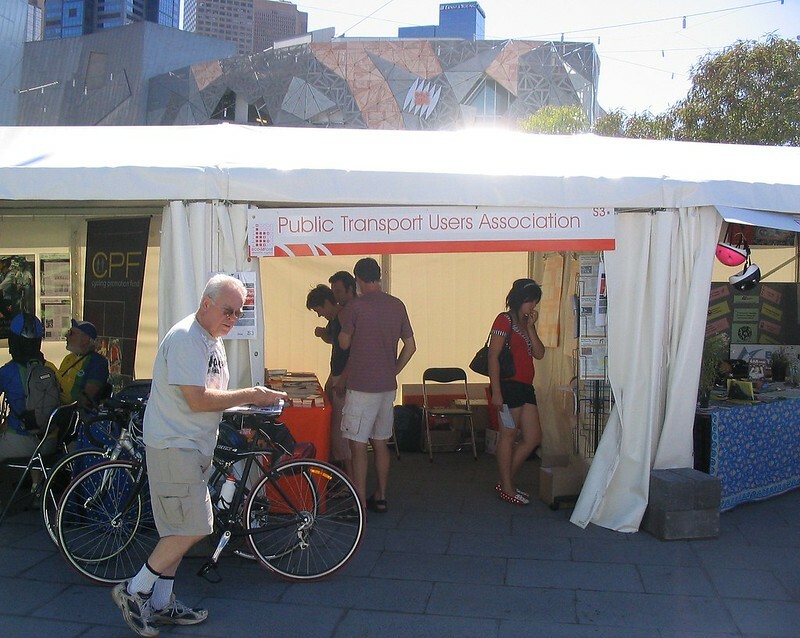 For some years the PTUA ran a stall at the annual Sustainable Living Festival at Federation Square. Often it could be stinking hot in the tents, and eventually we realised the considerable effort was not getting a huge return in new memberships. 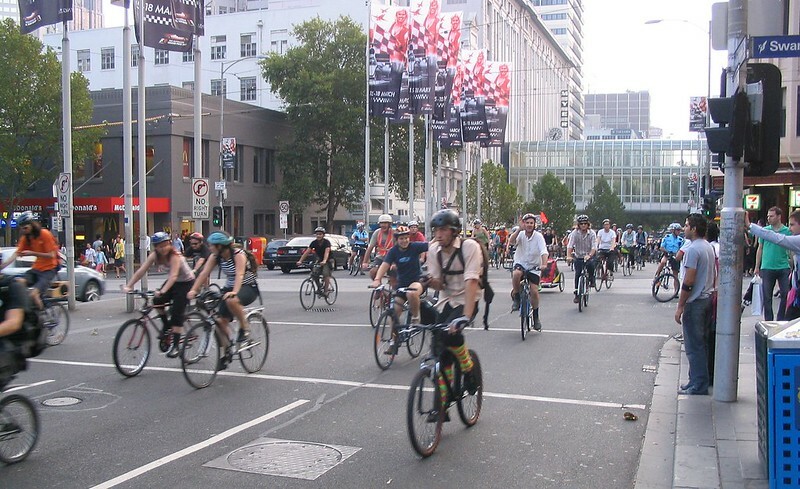 A Critical Mass bike event in Lonsdale Street. Do they still do these anymore? Unclear. 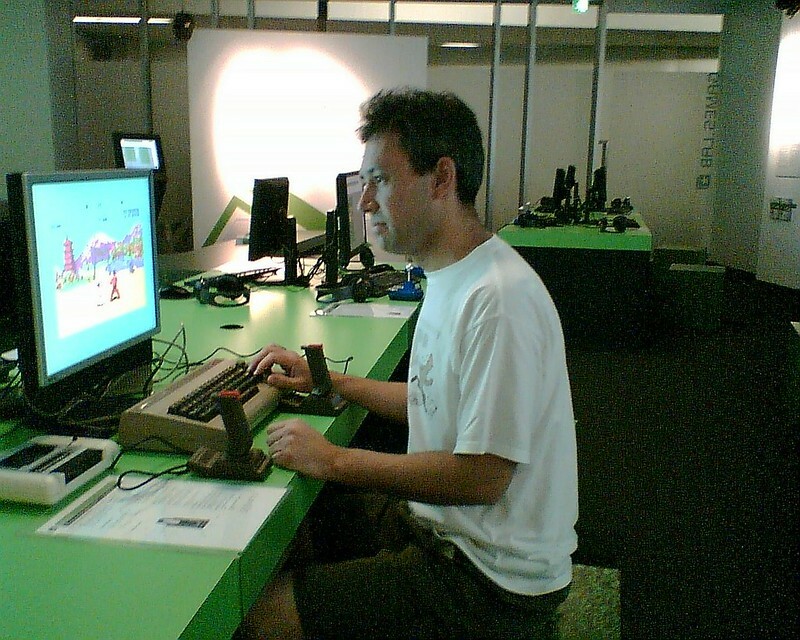 At ACMI playing old Commodore 64 games. This looks like Way Of The Exploding Fist. …the picture has shown up (with permission) in various spots related to vintage video games. 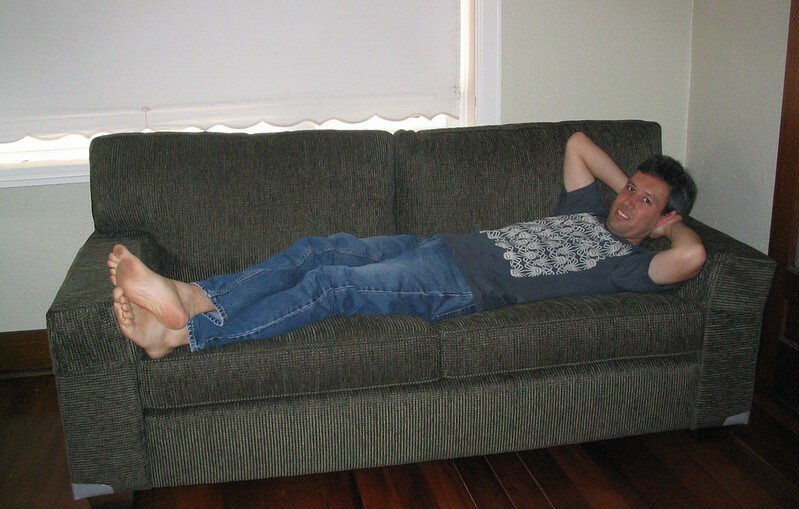 Finding this photo means not only have I had this couch for ten years, that t-shirt (which I still have as well) is also a decade old. 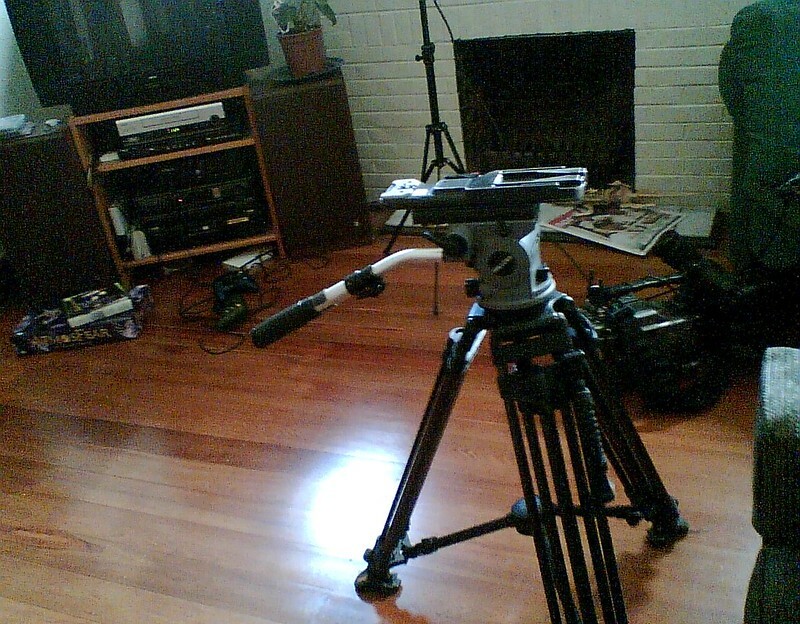 An ABC crew came to visit one Saturday. The story was about Connex’s SMS alerts service being hacked. In the end, as I recall, they went to a lot of trouble to light my livingroom just so, and filmed me showing the hack text on my phone, then never used the footage. Next → Next post: Save the trees, or save the world? 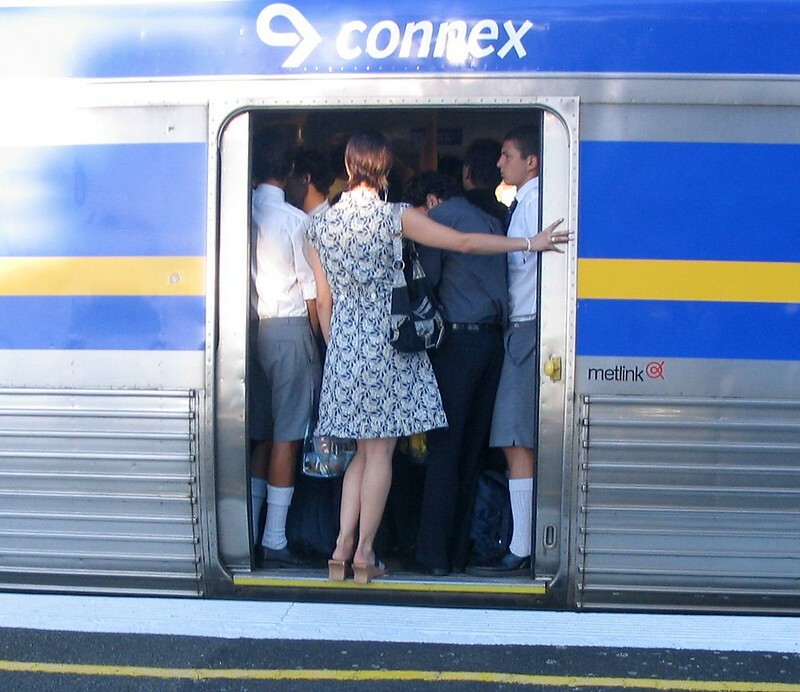 The abolition of Zone 3… until it was revived under Myki for northern Geelong and similarly distant regional centres – further out. Interestingly, all Zone 3 stations overlap with either Zone 2 or Zone 4 (Lara overlaps with both). 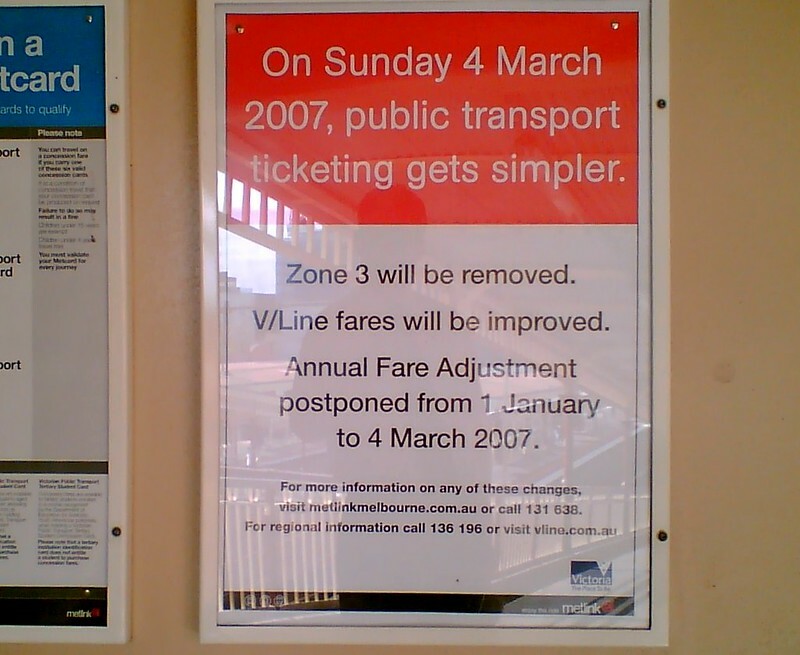 Correct me if I’m wrong, but the V/Line fare reduction at the time, as well as the expansion of Zone 2 pricing further into V/Line areas, meant that the abolition of Zone 3 did not create distortions in the wider fare system – apart from making longer trips cheaper compared to Zone 1/2 – that are there following the abolition of Zone 1/2 pricing last year. This latter adjustment was to the benefit of Zone 2 commuters to Zone 1, but not for any commuters further out, creating anomalies. Rather than tinkering at the edges with political decisions, a full review of the wider system is needed to remove the anomalies – but of course that would mean winners and losers. But I think one of the underlying principles of the system should be that the whole journey is at least no more expensive than any combination of shorter trips.